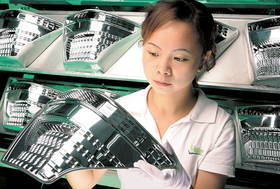 Earlier this month, Valeo posted a bigger-than-expected full-year net loss. PARIS -- The French government's strategic investment fund (FSI) said today that it has taken a minority stake in automotive supplier Valeo. FSI said that Valeo's sector position is "strategic" and the automobile industry will face "significant evolutions" in the months and years to come. Valeo has been hit by slumping sales as carmakers have been forced to slow or stop production as the credit crunch hits car sales. Earlier this month, the supplier posted a bigger-than-expected full-year net loss and a 9 percent drop in sales, and scrapped its dividend for last year. Valeo CEO Thierry Morin said he did not see an end to the crisis that has hit the auto industry before 2011. The FSI said its decision to buy a stake in Valeo would "contribute to the stabilization and reinforcement" of the supplier's shareholding and help it confront the crisis impacting across the car industry. The fund is charged with defending and supporting French firms in strategic sectors. French President Nicolas Sarkozy created the fund in December. The FSI's joint holding with its controlling shareholder Caisse des Depots controls 8.33 percent of Valeo's share capital and 10.55 percent of its voting rights. State-controlled bank Caisse des Depots already owned 5.99 percent of Valeo. FSI head, Gilles Michel, said the fund had bought Valeo shares on the market and is as yet undecided on board representation. Michel said the fund had bought the Valeo shares after Valeo's Morin contacted the fund in mid-January. Michel was managing director of the Citroen brand at PSA/Peugeot-Citroen before moving to the fund in December. Investment fund Pardus, which owns 20 percent of Valeo, had no comment on the move. The Le Figaro newspaper said, without citing sources, that French car parts maker Treves will also get financial help from the FSI, while the fund is examining potential investment in car parts maker Heuliez.